You got some new desks a tad too big for the space available and now you need to re-adjust the legs or saw the top off the desk. Or maybe you are hanging up a new shelf to provide relief for your overflowing bookcase. Whether you get a corded or a cordless drill is up to you. The first one tends to have more power, but the latter one doesn’t have cables to get in the way on those fiddly tasks. I’d make sure to get one of those that isn’t just a drill but it’s also a driver, so you only need one tool for the job. When you need to get something done quickly, electric screw drivers are essential. Ratcheted ones tend to be my favourite. I also don’t know what I would do without my multi bit screw driver – spanned screws are no fun, especially if you need to deal with them again at a later point. Do it properly now and you’ll save time later. If you tend to customise your furniture a lot, you will try to get rid of nails as much as you will hammer them in. A claw hammer is very helpful for this – in fact, many nails can be pretty impossible to pull out without one! You can use your pliers for cutting wire or instead of wrenches, or even to hold nails in place as you hammer them down – no more whacking your thumb by accident! 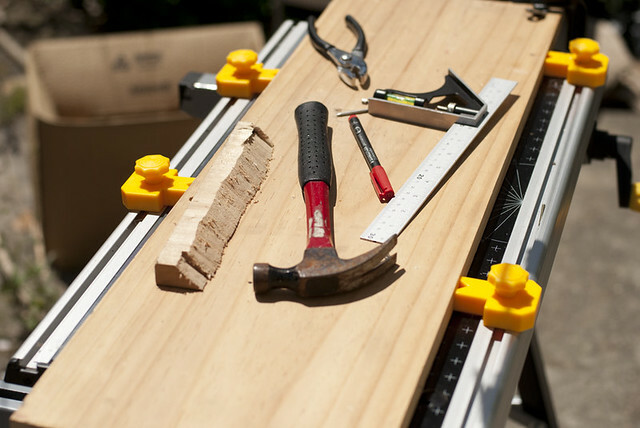 Unless you have a thing for tilted shelves and wobbly tables, a level is a very useful – essential, even – tool. It can help even when you put pictures up! Last thing you want to do is nail holes in your wall only to realise they are not in a straight line – unless you particularly enjoy wasting time refilling and re-painting that is. A spirit level ensures you’ll never do a wonky DIY job again – you can even get a spirit level app for the iPhone, although I’d always recommend using a real one! This is basically where almost every single DIY project starts. Before you buy furniture or make it, you have to know what will fit where. It’s one of the most obvious tools, but also one of those that’s easy to forget about. Too many DIY newbies attempt to guess whether that new chest of drawers will fit in the space given, and lo-and-behold it rarely does. A non-flex tape measure that can be held out straight (not a flexible dressmaking one) is imperative to any DIY task so you can take measurements to the exact millimetre. For those desks that are too big. Or for when you want to make your own. Be warned though – you’ll need some serious muscles to use this thing for any length of time, either that or you’ll develop them by the end of the day! This includes sanders, various coatings for your wood furniture, fillers and odds and ends like screws and nails. I wouldn’t keep a large stock, but if you know you like oak furniture for example, you will want to keep the right coating on hand to save numerous trips to the hardware store later on. As for sanders, if you find you’re sanding rather a lot of things you might want to consider investing in a power sander rather than just doing it manually so you don’t get tired. I once spent five hours on end sanding by hand and I couldn’t move my arms at the end of it! There are many tools out there, but these are the ones I keep coming back to. Sometimes I’ll get half way through a project and wish I really had this or that thing – you can save yourself a lot of time and headaches if you just have the right tool for the job in the first place. What tools are on your essentials list? About the author: Estelle Page is a self-employed interior designer on a mission to make the world a prettier place to live in, one home at a time.